A look at the results and the 'who, what and when' of our UK Racing Tips. With UK racing’s flat season now starting, it’s a good time to look back on our package’s results so far and to detail what we have to look forward to over the coming months. The focus for this package is on horses that are well in the market, but still good value. That results in a relatively high strike-rate of winning bets as well as consistent profits. Members have made more than 50 units in 2017 at 19% Profit on Turnover. The overall strike-rate for the UK Tips is now 40%. Take a look at the detailed results of the UK racing tips and you will soon see the significant edge. What: Follow the bets of a very successful UK syndicate. High strike-rate bets from a combination of ratings, form and stable information. These selections are better than 10% profit on turnover for the last 3 years. When: Normally 2 or 3 bets each weeknight delivered around 5pm AEDT. The races are actually on at a decent time for the next 6 months, or you can just get your bets on around 5pm and wake up to winners more often than not. Who: An expert UK horse racing analyst working closely with the brains behind our highly successful Golf Syndicate. He has achieved better than 10% Profit on Turnover for each of the 3 years he has been operating privately. “The intense knowledge that I gained from managing horses, syndicates and owners’ bookings really assists my approach to betting. I find that the blend of the ratings, the knowledge of the stables, the horses and the conditions up and down the country really help. Bets: Recommended at Betfair SP (which has massive liquidity on all of these races) or with local corporate bookies, which means that even if you are are limited at some bookies you can still get on. 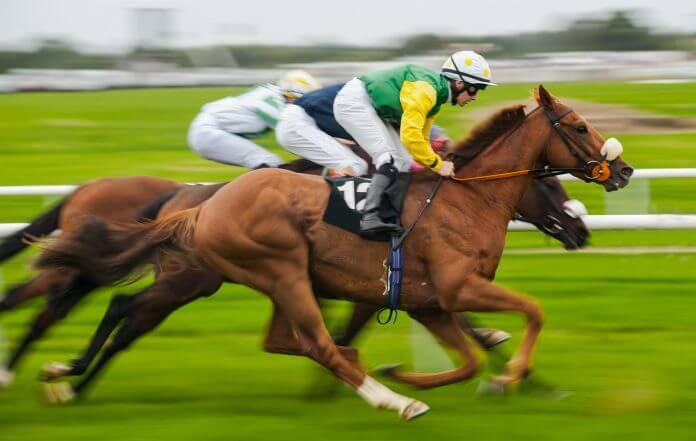 The UK racing package is informative yet easy-to-follow, allowing both novice and professional punters alike to quickly and easily make quality bets. It’s exceptional value and of course the Profit Guarantee applies to both quarterly and annual packages! Man From Mars needed every yard of the trip yesterday to get home, but it was a good battling performance after he was well backed. A step up in distance beckons, or perhaps just softer ground, but I actually think the running style of the horse will be more important. He looks like he does not want to do much when he is in the pack and clearly responds when he gets into the open. He can certainly be covered up, but should not be asked for his effort until he is taken into clear running space. I am sure that we were a little unfortunate with Fields Of Glory. Everything was going to plan as he moved into fourth and was challenging for third after being held up. I believe he would have reached second spot and may have closed on the winner. I was certainly counting the place money but he landed awkwardly and did the splits to come down at the third last. I will add him to the notebook as the step up in distance looked to suit him very well. The Aintree Festival starts tomorrow, which signifies that we are close to the end of the main jumps season. We will also begin betting on the flat on Friday, so it will be an interesting end to the week. Carlisle and Wincanton today, where it will be good at Wincanton but soft at Carlisle. ”Very good horse. Held up, given time to make up for slight jumping errors. Powered on when it mattered in heavy ground. Big engine. Big future.” The problem is he is 1.30 today but should win easily. No other bets at Carlisle. At Wincanton, I think we can oppose the odds on favourite Innocent Girl in the 2.50. She has won a couple of modest chases recently and now reverts to hurdles as the stable look to take advantage of the lesser handicap mark. She is moderate, and has made a lot of jumping mistakes. Sometimes horses that make mistakes often struggle when reverting to the faster pace of the hurdles contests and she is short enough for a horse that is not the most robust and is officially out of the handicap. The one that may surprise on this ground is Listen To The Man. She has always been campaigned on soft going, but this is the absolute minimum trip today and I think she should handle it OK. Her form behind the likes of Louis Vac Pouch and The Nipper suggests that her mark of 115 is perhaps a little low and at the relative price compared to the favourite I think she is good value. 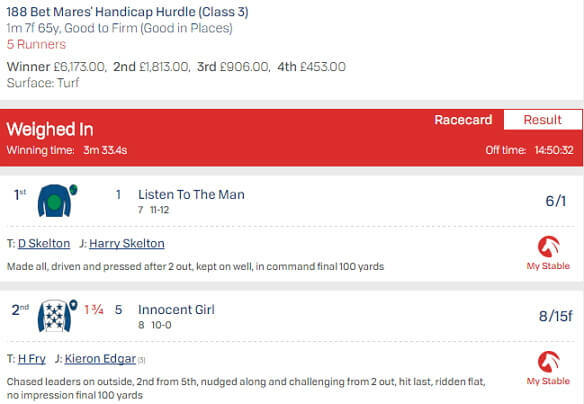 2.50pm Wincanton (Race 3) – Listen To The Man, 1.50 Units Win at Betfair SP. Listen To The Man got the job done at $7.80 Betfair SP to comfortably beat the hot favourite. We’d love to have you on board, so give the office a call on 1300 500 057 if you have any questions at all. A detailed Q&A with the man behind this service is available on our UK racing tips page.